Today start is the first day of giveaways. Today this is what I am giving away. 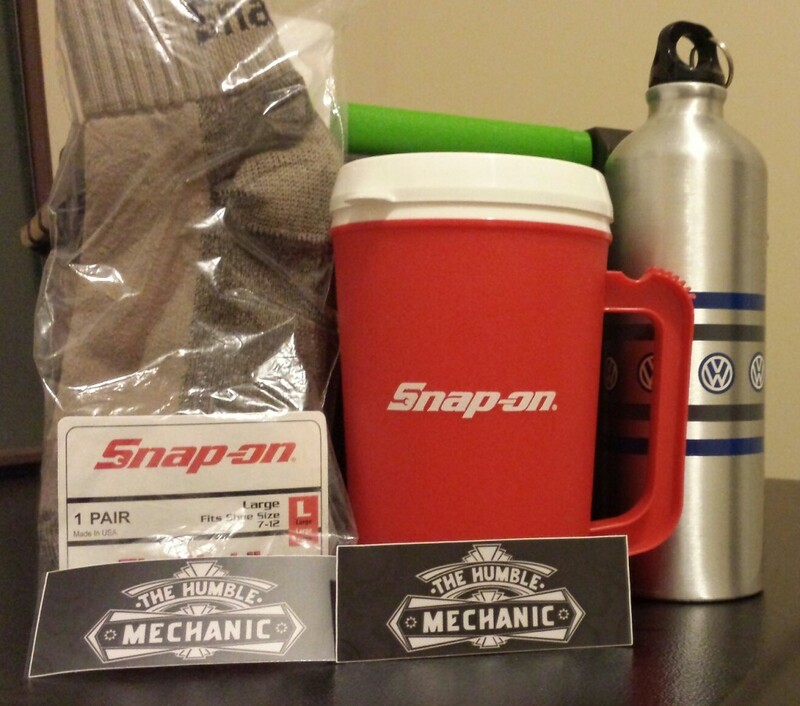 We have a Snap-On mug, A pair of Snap-on socks, an aluminum VW water bottle, and some ultra rare Humble Mechanic stickers. HOW TO WINThis one is super easy. Just make a comment in this post and tell us what your first car was. You know, the year, make, model, and something cool about it. I will pick just use a random number generator and pick a winner. It is that simple. Don’t forget to post your tool box drawer pictures in the post on the Facebook page. It is the post that is pinned on the top of the page. Good luck everyone. Oh my first car was a red 1995 Jeep Wrangler. STOP THIEF! Is That Fancy Car Alarm Worth It? My first car was a green 1991 VW Passat. It cost all of $600 and was the best car I’ve ever owned. My first car was 1974 Renault 12. Bought as a rolling shell and restored it over a year and a half. No one thought i would ever finish it. First was a 63 Volvo 544 Sport, dual carb racing edition. Man I miss that car. first car was and still is a 1999 dodge grand caravan. it is a new england car so it it rusting out on me(needs a transmission pan now). only has 71k miles on it. i plan to keep it as long as i can, until the rust gets it at least. i love it even as a single male with no kids. it is purple and super practical. 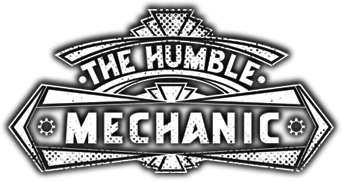 it hauls all my outdoor gear, camping stuff, rock climbing gear and bicycles. car is inconspicuous and gas mileage is ok.
My first car was a 1997 VW Jetta 2.0l. It was a nice car, but certainly had some issues. Windshield defroster and A/C did not work, so it basically became unusable in Minnesota. I still miss the car, though. My first car was a Ford tempo that thing was a heap og crap.I had a Egr problem and it would stall out at random.But a was a broke kid and couldnt fix it. I drove that thing i to thd ground. First car was a 1986 Mazda B2000 that burned oil so bad had to add a quart every Monday, paid $1000 for it and some kid from my highschool rearended me on the way home from school one day and his dad bought it off me for $1800 so we would not go through insurance and the kid drove it for another 2 years. My first car was a 1979 rabbit diesel. This one started my love for VWs and that’s pretty much all I’ve ever owned. I did try out a Chevy and Nissan at one time but there’s nothing like German engineering. 1990 Chevy Lumina Euro. Good, reliable car that got 30+mpg when I wasn’t being stupid and going 120mph…at a race track of course, right, at a race track. My first car was a 1996 VW Golf TDI. It was my very first car and I only got to drive it once due to a fuel pump failure l. Sad to see it gone but ill be glad to buy a new VW! My first car was a 1968 Chevelle. There was more bondo than steel on the car. The most interesting repair I had to do was to bolt the steering box back on when the bolts that held it to the frame finally rusted thru and the box fell off. Fortunately the car was not moving at the time. My first car was a 1990 Honda CRX. It was a huge turd but I loved it and it would beat most of the cars out there in a 1/4 mile. My first car was a 1995 Honda Civic EX. Still miss it till this day. It was an automatic and we did a manual conversion in shop class. My first car was a 2007 Toyota Camry. My favorite thing about it was the awesome shade of blue paint it came with. I also could hit 40 mpg on highway trips with some careful driving. My first car was a 85 Nissan 720 regular cab pickup. I still own it (8 years and counting) and it’s under the knife right now getting a high compression engine build with mild cam and Weber 38 carb. My first vehicle was a 1951 Chevy truck. The truck was originally my Dad’s . 25 years later I am in the process of a restoration on that same truck! @mitchell shoot me an email. Your number was picked. My first car was a 1962 Chevy Impala (this was before I discovered VW). I bought it from my brother for $200. It got me through high school. Somehow, the frame developed a crack near the left front wheel. I was able to weld gusset plates on either side and drove it another year after that. Good times. 1997 Mitsubishi Diamante. If you squinted at it, it looked like a beamer. 1984 Pontiac Sunbird with “gold”paint . 1986 Merkur XR4TI. Nothing like having a turbo charged rear wheel drive 4 banger at 16. I wrecked it after only having it a few months. 1983 rabbit gti, it came with a mix tape of hits from the 80s. Learned to drive manual in the girl too! I will leave the comments open, but the giveaway for Monday is now closed. My first car was a 1977 Chrysler Cordoba. Great car, but with a 400, driving around town meant single digit MPG. I still miss it. There wasn’t much that was great about my first car. It was a 95 cavalier z24 automatic. I guess it was nice that i got it for $400 and ran it for over 4 years with almost no maintenance at all. Wow, this article is nice, my sister is analyzing these kinds of things, so I am going to tell her.